Adam Yung was born a Muslim and adopted by a Caucasian Christian family at the age of 6. As far back as Adam can remember, he has always had a love and passion for music.Though raised as a Christian, Adam never really cared to know much about God and the Gospel of Jesus Christ. At the age of 10 Adam was diagnosed not only with bipolar disorder but also oppositional defiant disorder, just to name a few. Because of this opposition, Adam faced many disciplinary problems in schools and life in general. From school suspension to behavioral issues in the home, Adams mother was faced with the decision to begin heavy medication at such a ripe young age. This lead Adam to also begin self medicating through marijuana usage and alcohol abuse at the age of 13, which opened the door to a future of trouble and run ins with the law. A year later Adam faced his first arrest at the age of 14 which lead him to behavioral hospitalization. Over the years, Adams life was pure havoc due to drug usage and many more run ins with the law. At 17 Adam made the decision to leave home and face the world on his own. Doing so, he found refuge in the streets of Glen Park and later became a member of the well known gang, Gangster Disciples. With his newly formed street family, Adam embarked on a new venture of drug dealing, robbery, and other unmentionable endeavors. By the age of 18, Adam was homeless and found himself, yet again, in trouble with the law. 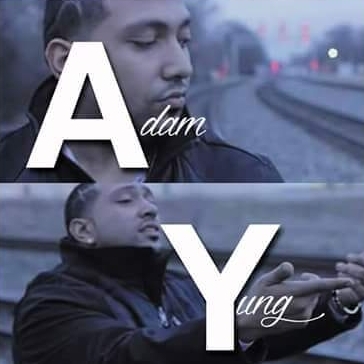 One night in a homeless shelter, Adam was approached by an unknown man who said this, ”You will be a tool in the music industry and God will use you as an evangelist”, Adam brushed him off and laughed at him and he never saw the man again. Now Adam faced a prison sentence of 26 months flat, no parole, no short time, the whole sentence. The night of his arrest, in the back of a police car, Adam spoke to God and said to Him, “I am yours, I am tired of running, use me as you please”. During his 26 month incarceration, God started speaking to him, Adam began fasting, reading the word daily and began to minister to other inmates and through his ministering, lives began to change. This is when the voice of the unknown man, came up in Adams thoughts and at this point, Adam found his calling. Today at 23 years old, Adam is a new creation through Christ and uses not only the gift of music to minister but also the gift of evangelism.. He hopes that he can reach out to others that are in the situations he faced and place a positive impact on their lives. His mission is to reach the broke, hopeless and lost to bring them the gospel of Jesus Christ.